What is that one word to describe any destination which has elegantly assimilated different cultures into one? Perhaps, cosmopolitan! However, even this word stands belittled before the bounteous Uttar Pradesh where different religions find safe nests for themselves. Being home to numerous holy sites, the destination also has several engaging stories related to it. One of an interesting legend states that Varanasi, one of the oldest living cities in the world was actually founded by Hindu God Shiva as his favourite abode. Some of the famous pilgrimage sites in Uttar Pradesh include Banke Bihari Temple, Sarnath, Salim Chisti’s tomb, Guru ka Tal and All Saints Cathedral. The state boasts of being the birth place of sacred Hindu Gods like Lord Rama and Lord Krishna. Lord Buddha delivered his first sermon after his enlightenment on the grounds of Uttar Pradesh. 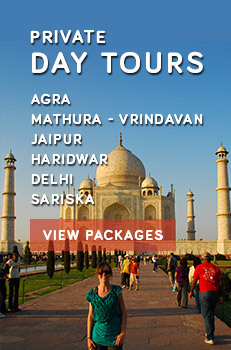 Opt for Uttar Pradesh Pilgrimage Tour Package to site the oldest, most beautiful and pious shrines of Northern India. Spot the unparalleled serpentine brackets in the Tomb of Saint Salim Chisti. Placed at the four corners of the four cardinal pillars, these brackets reflect an unusual Gujarati style of architecture. They are curved upwards and are made of white marble with rich carvings on them. This is a famous Hindu temple situated in Vrindavan town of Mathura district. It is devoted to Lord Krishna. The temple has been the architectural inspiration for several other Krishna-devoted shrines built in different parts of the country like the one in Bharatpur, Rajasthan. The temple was founded by a great poet and a musician named Swami Haridas during 1864. However, the idol of the presiding deity belongs to 1863 when it was worshipped in the forest of Nidhivan. The black and shiny idol of Lord Krishna stands in the famous tribhanga posture. It is a famous Odissi dance posture with three bends at different points of the body. The temple is seen crowded with devotees especially during the festival of Krishna Janmashtami (August- September). The day is celebrated as the birthday of Lord Krishna and he is adorned in colourful attire. Deftly cooked vegetarian meal is offered to the God and he is rocked in a cradle like a baby. There are no conchs or bells in the temple to maintain silence. 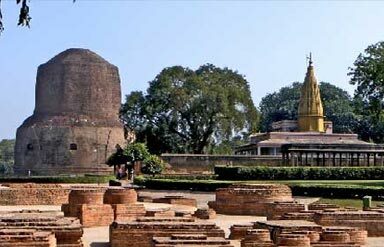 Any Buddhist Pilgrimage Tourism itinerary is incomplete without making a visit to the ruins of Sarnath. It is a famous Buddhist site located about 12km away from Varanasi. It is one of the major holy sites for Buddhist pilgrims known for its excavated half ruined monasteries and several votive stupas. It is also presumed to be the site where Lord Buddha gave his first sermon after attaining enlightenment. Pilgrims circumambulate the famous Dhamek Stupa standing at the centre of the city. The stupa was erected in 500 CE by Emperor Ashoka to mark the site of sermon. Chaukhandi Stupa is another most important shrine for the Buddhists. It is believed to be the ruins of a terraced temple built during the Gupta period. Amongst the modern constructions is the famous Mulgandha Kuti Vihar made in 1931 by the Mahabodhi Society of Sri Lanka. The interiors of the shrine consist of stunning mural art made by a famous Japanese artist named Kosetsu Nosu. The sacred relics of Lord Buddha brought from Taxila are kept in the shrine. The exposition of these relics takes place on every Buddha Purnima (April- May). Shaikh Salim Chisti was a famous Sufi saint who had blessed Emperor Akbar with a male heir. 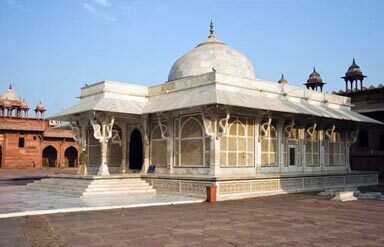 His holy tomb rests in the well- planned walled city of Fatehpur. Muslims from different corners of the world visit the shrine to seek blessings. After his death, Akbar humbly buried him in the same complex where he once had lived. The tomb apart from its religious significance is also valued for its stunning carvings. Built in Mughal architecture style, the tomb was laid by Emperor Akbar during 1580-81. It is square in shape and is elevated on a meter high platform. The surface of the tomb is richly carved. The plinth below is embellished with the motley of yellow and black coloured marbles. Also called as Mazar of Salim Chisti, the tomb appears to be a jewel box when viewed from a distance. Pilgrims visiting the site also religiously tie a thread at the marble windows of this tomb. It is believe that every wish is fulfilled by tying the thread. This is a historical site for Sikh pilgrims situated in Agra district. 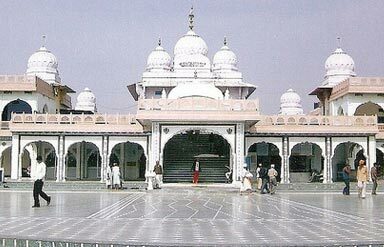 It is a Gurudwara dedicated to Guru Tegh Bahadur who was also known as Hind-di-chaadar. He replaced Guru Har Krishan on April16, 1664, to become the ninth Guru of Sikhs. The saint was killed in 1675 on the orders of evil Mughal Emperor Aurangzeb in Delhi. The site actually had a reservoir (tal) earlier which was used to store rainwater in Agra. It was built in 1610 during the rule of Emperor Jahangir. It walls and embankments are built of large and unpolished stones laid in rubble masonry. Presumably, it is the same spot where Guru Tegh Bahadur had surrendered himself to Mughal Emperor Aurangzeb’s army. Built during 1970s, this holy shrine commemorates the effort of this famous Sikh saint. There were 12 towers in the Gurudwara with only eight of them left today. Red sandstones have been used in its construction alike many other architectural marvels of Mughal. It is a famous English church sited at the crossing of two main roads of Allahabad namely MG Road and SN Road. It is also known as Patthar Girja, it is one of the finest examples of Gothic style of architecture built by the Britishers in India. It is a classic example of Gothic revival movement which gained momentum during the late 1970s in England. British architect called Sir William Emerson designed the church in 1871 AD. He is best known for his architectural contribution to the famous Victoria Memorial in Kolkata. It took nearly four years for its completion. The central part of the shrine is about 13m wide and nearly 40m long. It can accommodate almost 400 people at a time. Though so many centuries have passed by but the intricate glass and marble work stills look intact. Ornamented tablets are placed in the cathedral depicting information about different British nationals who died during their rule in India. Sprawling gardens add to the charm of the site. Shrines have a power to purify your senses and your thoughts. So, go for a soul-stirring experience with the Uttar Pradesh Pilgrimage Tour Package.